The dog was found in an unoccupied house in Babylon. Suffolk County SPCA rescued a dog a dog from an unoccupied house in the Town of Babylon on Thursday. A call came in to the animal rescue group that the abandoned dog was inside the home. SPCA Detective John Caracci responded to the call with the Suffolk County Police Department and the Town of Babylon Animal Shelter. An officer from the Town of Babylon Animal Shelter noticed that the dog had several wounds. Caracci took the animal to a Veterinary Hospital where it was treated. Officials stated that 38 puncture wounds and seven slash wounds were found on the dog’s upper body. Suffolk County SPCA Chief Roy Gross named the dog “Miracle” due to the fact that the dog was able to survive the wounds, and is already set to be adopted by an approved family. The family recently lost their dog. 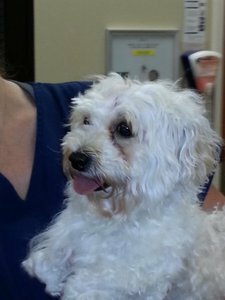 Miracle (pictured) is a three-year-old female Maltipoo. Caracci will be continuing the investigation into her discovery. He thanked the Suffolk County Police Department and the Town of Babylon Animal Shelter for their assistance in finding the dog. Anyone who is looking into adopting a rescue animal such as Miracle can find animal shelters throughout Long Island. Save-a-Pet Animal Rescue is currently looking for a home for a young pregnant cat name Snowflake. Snowflake will be up for adoption once she is finished nursing her kittens. Every Thursday, see the Adoptable Pet of the Week on LongIsland.com, where we feature rescue animals looking for a good home. Subject: LongIsland.com - Your Name sent you Article details of "Suffolk SPCA Rescues Wounded Dog from House in Babylon"